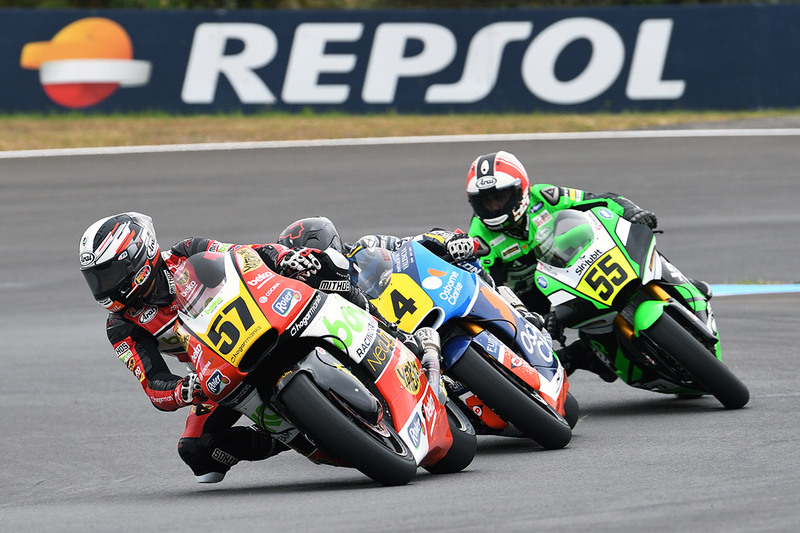 The 2019 FIM CEV Repsol season already has its first winners after today’s round at the Circuito do Estoril in Portugal. On a day affected by poor weather victories went to Barry Baltus (Sama Qatar Ángel Nieto Team) in the Moto3™ Junior World Championship, Niki Tuuli (Team Stylobike) and Alessandro Zaccone (Promoracing) in the Moto2™ European Championship and Ivan Ortolá (Sama Qatar Angel Nieto Team) twice in the European Talent Cup. Barry Baltus (Sama Qatar Angel Nieto Team) started the 2019 season just like in 2018 by achieving victory in the first race, although this time in the Moto3™ category. It was a thrilling race, especially in the first laps with a group of up to seven riders battling for the lead. Gradually a leading group of four formed: Barry Baltus, Maximilian Kofler (Sama Qatar Angel Nieto Team), Xavi Artigas (Leopard Impala Junior Team) and José Julián García (Fau55 El Señor de las Bolsas). Poleman Jeremy Alcoba (Laglisse Academy) followed, working hard to keep in touch with leading group. With seven laps to go Maximilian Kofler went down after posting the fastest lap, while José Julián García lost control of his bike and saw his own chances of victory disappear. Barry Baltus was left to take the flag without problems and Xavier Artigas and José Julián García joined him on the podium. The Belgian rider is the first leader of the Moto3™ JWCh category, and was awarded the Repsol free fuel cheque. However, everything changed with four laps to go when Yari Montella went down, losing all hopes of a win. But things went from bad to worse for the Team Ciatti rider: after rejoining in fourth position he fell yet again and in the end pulled out of the race. With Niki Tuuli winning and Edgar Pons taking second, the third podium position went to Randam Rosli (Onexox TKRR SAG Team). In Superstock 600, Joan Díaz (DCR Racing Team) was first after tussling with Peetu Paavilainen (Redding – Pinamoto RS) until the Finnish rider went down on the very last lap. The second Moto2™ race was declared dry so all the riders were able to put on slicks. From the start Niki Tuuli took the lead ahead of Edgar Pons and Héctor Garzó (CNS Motorsport), setting a pace that surprised his rivals. However, Héctor Garzó put in a series of fast laps and pulled back the Team Stylobike rider, taking Alessandro Zaccone (Promoracing) along with him. On lap nine Héctor Garzó and Niki Tuuli both rode across a wet area of the track and almost went down. Alessandro Zaccone took advantage of their error and established a lead which he held to the end. Despite falling back to fifth position Niki Tuuli recovered well to cross the line in second place. Edgar Pons took the final podium slot by beating Héctor Garzó by barely half a second. With these results, Niki Tuuli leads by 9 points from Alessandro Zaccone and Edgar Pons. The Promoracing rider earned the Repsol free fuel cheque. Alessandro Zetti (Fau55 El Señor de las Bolsas) was the best in Superstock 600. Sama Qatar Ángel Nieto Team rider Iván Ortolá won in his first ETC race, taking advantage of the difficult weather conditions at the Portuguese track. Poleman José Antonio Rueda (Talent Team Estrella Galicia 0,0) was unable to benefit from his pole position: after a problem on the warm-up lap he had to start in the last position on the grid. Teammate Diego Moreira also had problems: he was badly placed at the start and after being informed that he had to do a ‘ride through’, he did a ‘long-lap run’ by mistake, and later went via the boxes and thus lost all his options of a podium finish. There were numerous falls that took place during the race, notably including those of Clement Rouge (Equipe de France – Filière GP) and Marcos Uriarte (MRE Talent) while they were fighting for a podium finish. The last laps were a tussle between Fenton Seabright (Wilson Racing) and Iván Ortolá right to the finish line, ending with a collision that caused the Briton to go down while crossing the line. David Muñoz (Jerez Andalucía Motor Talent) took the third podium slot. Iván Ortolá was awarded the Repsol free fuel cheque as the winner of the race. The second ETC race was rain free but slicks were still not viable. The race developed into a struggle with up to 13 riders in the fight for victory. At all times, Ivan Ortolá was in the front positions, along with David Alonso (Sama Qatar Angel Nieto Team) and a remarkable Marcos Ruda (Cuna de Campeones) who had come up from 15th position on the grid. With such a large group it was impossible for any of them to pull away, so victory was decided on the finish line itself. The last lap was a constant head to head battle; David Alonso led out of the final corner but was passed by Ivan Ortolá and Marcos Ruda and had to settle for third position. With these results, Iván Ortolá will head to in Valencia as leader of the ETC 23 points ahead of Marcos Ruda and 24 ahead of Fenton Seabright. In addition, he was the winner of the Repsol free fuel cheque after his double win. In the last race of the day, in the ETC Series 2, Roberto García took the victory.